Live Creating Yourself. : Twinkle Your Home: LCY's First Giveaway! I present to you Live Creating Yourself's very first giveaway! Ahhh and the crowd goes wild! What I offer you today is undoubtedly a familiar sight to many of you blogoholics. And I am probably the umpteenth blogger to offer this give-away thanks to the fabulously generous and stylish CSNstores. After winning one of my very own Twinkle chevron pillows from Smitten Design and feeling oh-so giddy, I could not deprive my readers of the same offer. So! Thanks to All Modern Furniture, I have one Twinkle pillow in the color of your choice to give away! Bloggers love this thing. Check it out. 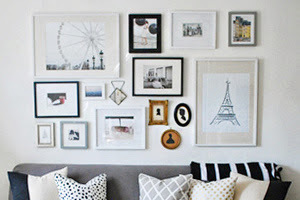 Erin Gates of Elements of Style has a pair of the navy pillows in her house. Paloma of La Dolce Vita had it on her holiday wish list. Michelle of Bohemian Season has two of the brown pillows on her couch. You have until midnight on Thursday. Winner will be announced Friday. Ohhh how exciting! Where would I put it? Hmmm... I think one would look darling on my green tufted side chair in our Living Room. 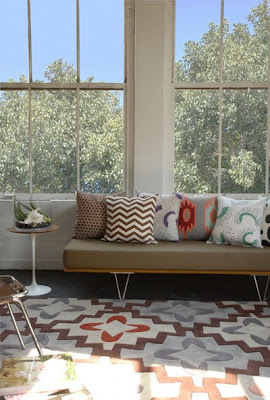 The modern lines of the chevron pattern would contrast the old-fashioned tufting perfectly. You're a doll. Best of luck to everyone! 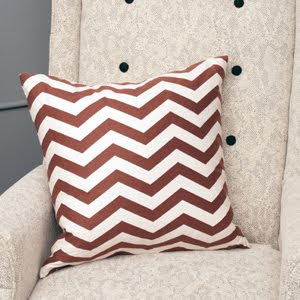 I MUST have this chevron pillow for my master bedroom. All of my bedding is solid, and I was going for a modern look, but I need pattern! If I win, I'll have to ask you for design advice on the color! Anonymous again. I just blogged your website on my Facebook. Want to win that brown Chevron pillow. Thank you. Seafoam! I just purchased a vintage seafoam-colored glass lamp at a garage sale and need to tie it into my neutral living room. This pillow would do the trick and jazz up all that beige. It would rotate between the armchair and the couch because my husband always tosses them on the other piece of furniture when he sits. Thank you and good luck to everyone! Love these pillows! The blue chevron pillow would be perfect in my living room...I am moving into my first house this week! i would love to win the pillow and use it for my couch! thank you! YOU HAVE TO BE KIDDING ME! I have bee wanting one of these pillows for soooooooo long...(why I haven't just bought it, i don't know...) but please include me in the running for this pillow. In all honesty, I would have to wait until I actually had the pillow in my possession to tell you where I would put it, but I can 1000% tell you it will go in a place where I can show it off and brag about it. Thanks!! oh my goodness... i can't decide between the brown or the light blue, both of which would go perfect in my bedroom OR living room, thus making the decision nearly impossible... ahh!! thanks for a fun giveaway! 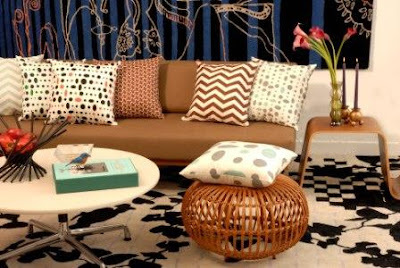 I would use the chevron pillow in my TV room. It's also a place I love to read. I am thinking blue because that is my favorite color but would have to ask your expert advise. I would put the turoquise one in my guest room. The bed is missing something and I think this pillow might be it. I love these pillows! I would put it in our family room. Thanks for the giveaway. I would put it in my bedroom. Just like one of the other readers, I think the pattern would contrast nicely with the traditional look of my tufted headboard. Thank you for a great giveaway! I rarely enter giveaways, but I want one for my great room! I love the light blue pillow! It would look fantastic in my bedroom. 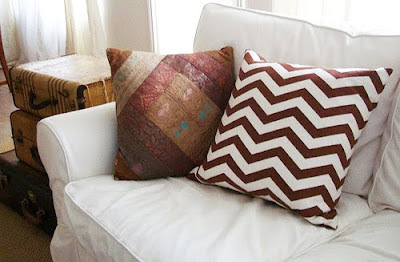 I love the chevron pattern of this pillow! I would probably put it in my living room or bedroom, but to be honest that pillow would look great anywhere! One of those pillows would look great in my bedroom that I am currently decorating! I would love to have one of these in my living room, I have a huge sectional and I love lots of pillows, it adds some character to the room. I am actually looking to switch up the pillows on my couch right now! Love them! I have been pining away for my very own zig zag pillow. My living room couch is sooo excited at the possibility of it that he's already made room for this adorable pillow. I'm loving chevron so much right now! Ooh yes please, they are gorgeous! 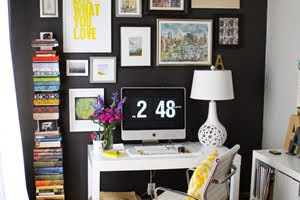 I'd take a navy one and put it in my little office so I could see it while I'm working away! ps Nothing to do with the competition but I'm passing on a blog award to you! Love the chevron! It matched my blog header! I would put mine in my living room for sure, on an overstuffed leather chair! Very pretty! I would put it in my living room. Thanks for the chance. The chevron pillow in chocolate will definitely be front and center on my couch in my living room! This pillow would most likely make its way into my reading chair! Definitely on my couch! Great giveaway! What a great giveaway! Love these pillows! Living room couch! Definitely on my sofa. It would go so perfectly with the other pillows! These are pretty! I'd put mine (if I won) on my bed! Gorgeous! Mine would go on the living room love seat. My living room couch is lonely so I decided I'd carefully place it there where it would add some glamor to the whole room. Love! I'd put the navy pillow on my new orange chair that I just reupholstered! I would put this adorable pillow on my new grey couch! Oooh, you know I love a giveaway :) I would LOVE that brown pillow on my family room sofa right smack between my two monogrammed ones. I was thinking of adding an animal print but this would look SO much better! What a great giveaway. :D I would liven up one of my living room chairs with this beauty! My pillow would probably go on my bed because the dogs would eat it otherwise. Very chic. I would place this lovely in our living room, which happens to be about that shade of brown. Lovely pillow! It would go on a sofa in my den & look great! Love the pillow. It would like great sitting on my blue chair in my living room. Love the pillow, I have an antique ladder back chair that I painted bright cobalt blue. I have it in my den, and it is a little loud...to say the least. I think this pillow's urban feel would look great on the chair, as well as make it a little softer and more inviting! Great idea by the way! These would go great on my bed against my cherry headboard. I love the seafoam one. It would go in my living room for sure. That is the room that gets used the most & SEEN the most! the pillow will go on my sofa! I would love to put it in my chair next that is next to my fireplace. The pillow will go in my living room, love the way it looks. Dang- look at all the comments! I would but the light blue zig zag on our bed. I love this pillow! I would put in on the chair in my office and it would really be the statement maker I need to finish things off!!! I would love the brown pillow! Great giveaway! Oops, forgot to say that they brown would look great in my bedroom! I just stumbled upon your blog and am excited I got here in time to enter! Ahhh! LOVE these Twinkle pillows. I have seen these all over but they are instant classics. Amy dying for one of these to go right on my living room couch w a few other pillows and it will add just the right graphic element. THanks for this giveaway, I seriously love these pillows. Great blog! Love the classy-ness of these pillows! I would put it in my living room! The pillow will go on the living room chair. Thanks! I would put it on my living room couch. The pillow will reside on the leather couch in my living room. I would love to win the pillow... it would look perfectly in my husbands office (his office is in our home) on a brown leather loveseat. Oh I want entered into this contest to win this sweet pillow! I would use it on my couch that we have in our den. Would love the navy and white. Just found your blog for the first time. How exciting! I saw the message on Twitter about the two mags coming together. How exciting! I would put the pillow in our family room. That is the room we live in.